Last week, following an important workshop in Cambodia focused on regional biodiversity, wetland and forest conservation, I was taken out for some excellent local birding by Colin Poole and Simon Mahood of the Wildlife Conservation Society (for which many thanks!). A total of five Oriental Skylark Alauda gulgula, of subspecies herberti, were among the 80 or so species that we found on the edge of Phnom Penh in a range of interesting habitats (see: http://ebird.org/ebird/view/checklist/S41002705). 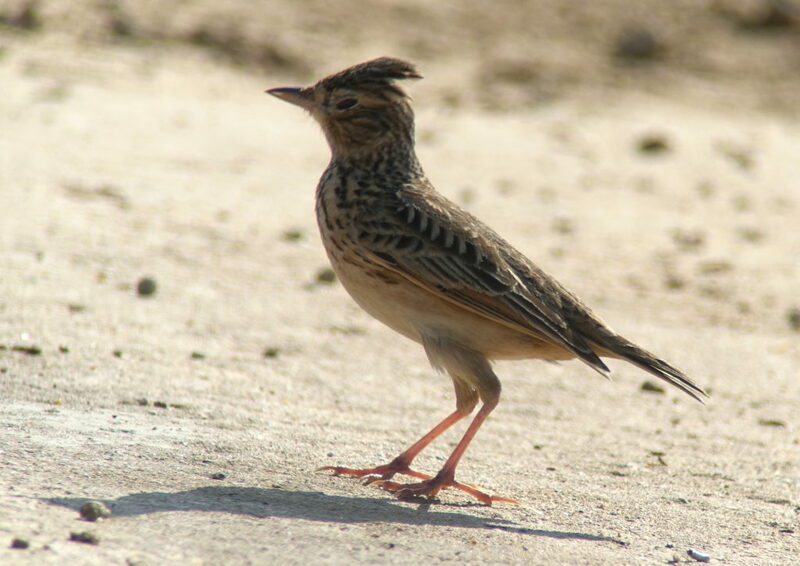 Oriental Skylark is an effectively sedentary “southern” species. Nonetheless, the species has been claimed in Japan; and very occasional birds in Korea (e.g. on Ulleung Island in 2013) and in northeast China have also been tentatively (?) 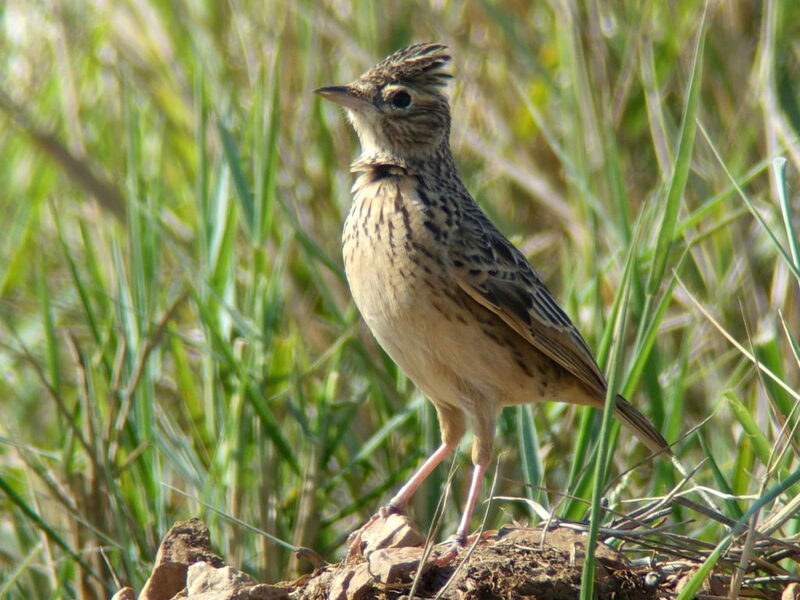 identified as Oriental Skylark, based on distinctively odd calls given by apparently smaller larks. 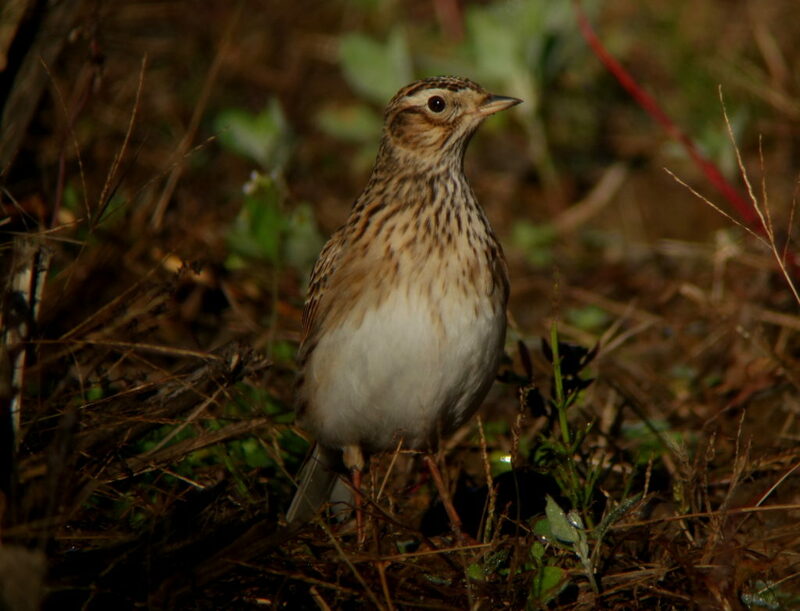 It therefore seems helpful to share a few images and comments here on these Cambodian birds – both to help with the identification of any possible stray Oriental Skylark to Korea, and also to help show how strikingly different these birds were in structure from both Eurasian Skylark A. arvensis and what Birds Korea continues to consider – contrary to e.g. Gill & Donsker (2017) – as a distinctive species, Far Eastern Lark A. japonica, comprised of the nominate and intermedia subspecies, based e.g. on sympatric breeding with Eurasian Skylark; different vocalisations; lack of tail fanning; measurements; and multiple subtle plumage features. 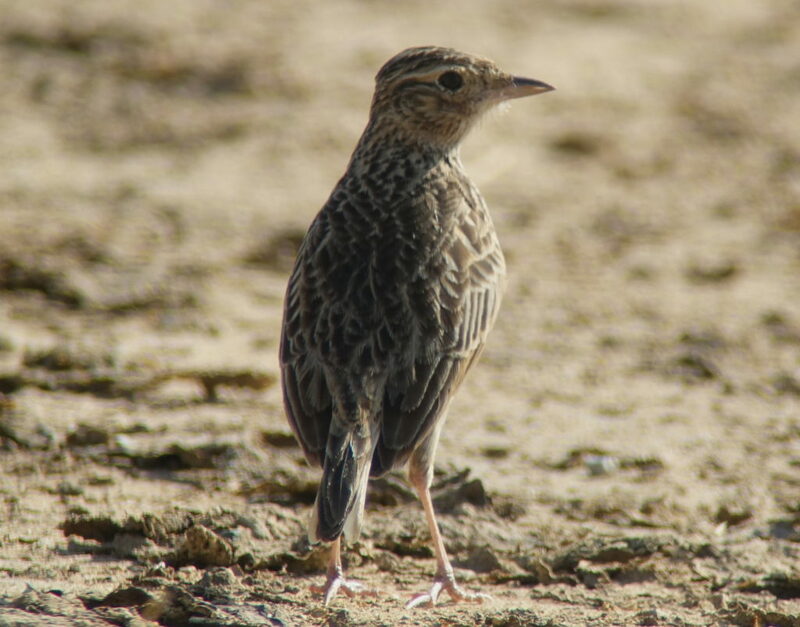 The images posted here are of one or two birds out of a group of three Oriental Skylark that we watched in song; chasing each other; and standing out in the open. 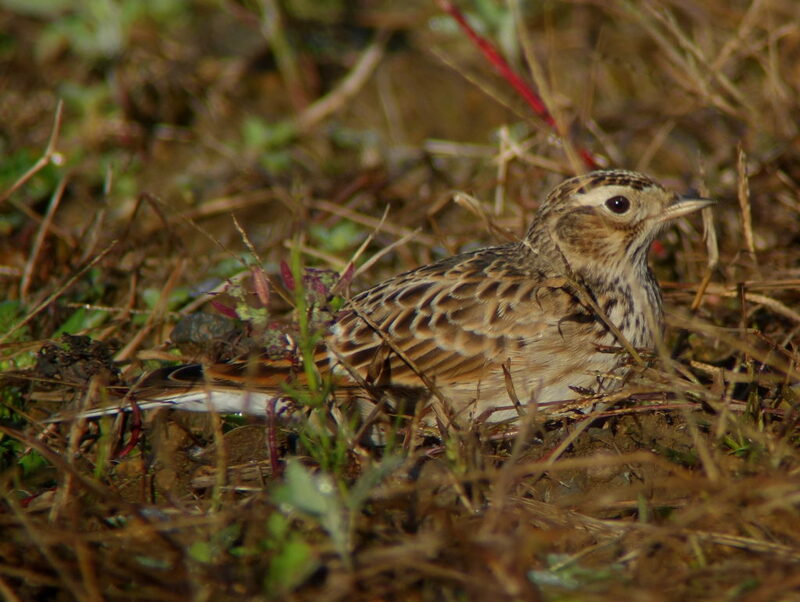 Three images of a Far Eastern Lark, digiscoped on Ulleung Island, Republic of Korea, on November 4th 2014, are added to help with the comparison. In the field, at all times the single most striking feature was how short-tailed all these birds looked, both on the ground and in flight. Their primary projection also looked short; and their legs looked very clean pale pink and very long. This longer leg length was especially obvious as, unlike Eurasian Skylark or Far Eastern Lark which often crouch, the birds often stood ‘upright’ with a posture somewhat suggesting Richard’s Pipit Anthus richardi – though with the tail falling far short of the ground. Their short ‘back end’ likely contributed to their big-headed look – an effect also accentuated by their full crest (perhaps similar to Eurasian Skylark, but longer and more prominent than expected in Far Eastern Lark) and unexpectedly heavy, long and pointed bill, with horn-coloured lower mandible and dark upper mandible. The Oriental Skylarks‘ upperparts were dark, lacking any clean white fringes, and even the outer tail feathers were washed buff or sand-toned. The closed wing showed extensive rust, even more than might be expected in a Far Eastern Lark, which shows broad rusty fringes to more obviously black-centred remiges. Unlike in Eurasian Skylark and Far Eastern Lark, both of which have white bellies, all of the underparts were washed through with buff and rust (somewhat suggesting the comparison of Blyth’s A. godlewskii and Richard’s Pipits), with rust tones strongest on the lower breast. The birds lacked a malar patch; their throats were unstreaked; and the heavy streaking was concentrated on the upper breast, forming an inverted “V” centrally and continuing along the flanks, closer to Eurasian Skylark than Far Eastern Lark (in which the streaking is fine, more or less even, and more or less confined within the buffiest band: see below). 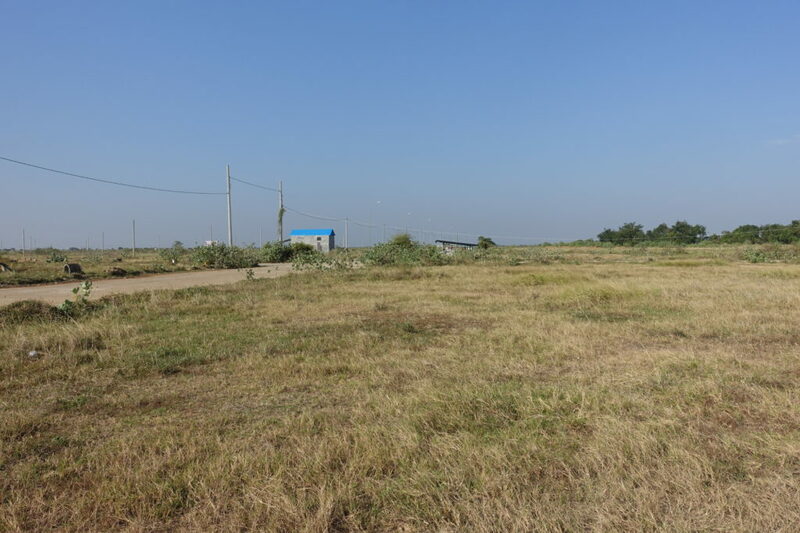 In flight, the Oriental Skylark we saw recalled Indochinese Bush Lark Mirafra erythrocephala present nearby at the same site, in that they looked very broad-winged and short-tailed – strikingly unlike either Eurasian Skylark or Far Eastern Lark. This distinctive profile really should be obvious to any experienced birder; and presumably any lark lacking such a profile seen in Korea or in Northeast Asia will not be an Oriental. The open upperwing of the Oriental Skylark also looked strikingly different to that of either of the more northerly-distributed larks, with a paler forewing and a band of plain rufous across the greater wing coverts and plain-looking flight feathers, showing more contrast even though they effectively lacked the fairly broad white or the narrow off-white trail of Eurasian Skylark and Far Eastern Lark respectively. From below, the underwing coverts also looked to show some contrast with the rather paler flight feathers. During a dozen or so observations of birds either in song-flight or in normal flight the tails also appeared to be held tightly closed – again unlike Eurasian Skylark which often holds the tail open; and Far Eastern Lark, which often holds the tail partially open. Again, any lark in Northeast Asia that regularly holds the tail partly or fully open in flight will likely not be an Oriental. Of interest, perhaps due to their closed tails, birds dropped to the ground without the decelerating swerve of Far Eastern Lark. Presumably, this behaviour relates to the prefered ecological niches of these larks – with Oriental Skylark perhaps more regular in seasonally drier, open habitats; Eurasian Skylark more typical of extensive temperate grasslands, with long grasses; and Far Eastern more typical of heavily overgrown, tangled ‘edge’ habitats, mixed with open patches. We did not attempt to record the birds. However, to my ears their song sounded closer to Far Eastern Lark than Eurasian Skylark, in that they were quite simple and repetitive and at least when we heard them, lacked the more melodic ‘lu-lu-lu’ notes heard from some Eurasian Skylark heard in Rason (DPRK) and in western ROK. Flight calls were also rather less melodic than those given by Eurasian Skylark in Korea, often quite similar to Far Eastern Lark, and not as striking as my (perhaps exaggerated) memory of Oriental Skylark heard >20 years ago in both India and Thailand. Among some unremarkable generic lark-type calls the birds also gave a slightly buzzy “Zarb-Zarb” ( rather than the oft-cited “Baz Baz” of Oriental), again quite similar to some of the calls given by Far Eastern Lark. Without much greater experience of all the relevant taxa, I therefore doubt that I would be able to pick out an Oriental Skylark from a flock of Far Eastern Lark based on the range of calls that we heard. It would, however, be much easier to pick one out from a flock of Eurasian Skylark, but only in areas without Far Eastern Lark! Finally, it is important to note that Oriental Skylark has multiple subspecies (no less than 13 are listed in Gill & Donsker 2017). It is therefore possible that some of the features shown by the Cambodian birds might be less obvious in other subspecies. 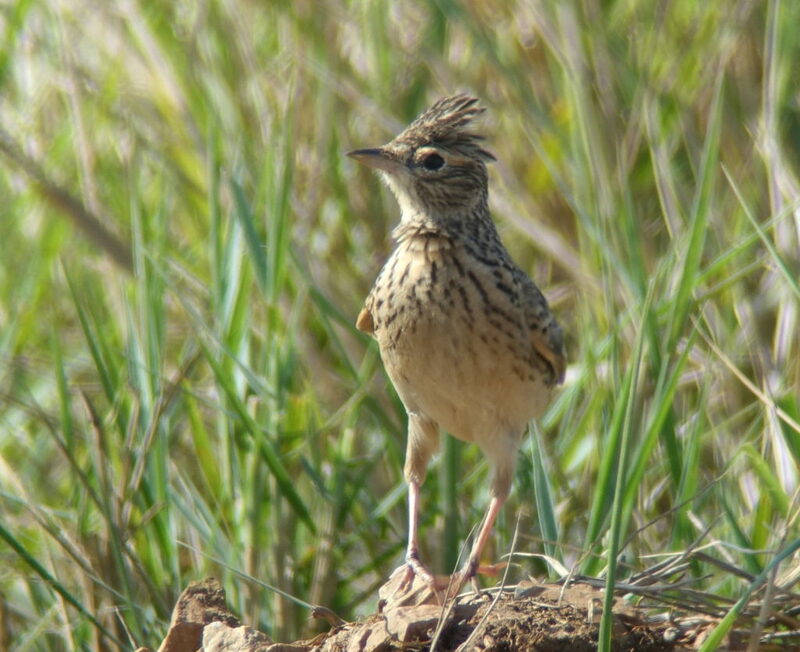 However, a seminal paper by Shirihai (1986) compared Oriental Skylark (presumably with the focus on more westerly subspecies found in Israel) to the extralimital Woodlark Lullula arborea, largely because of their relatively long, thick and pointed bills; their shortish tails; and their relatively long legs: all features strongly evident in the Cambodian birds. Moreover, multiple additional plumage features used to identify Oriental Skyark listed in the same paper were also shared with the birds we saw and digiscoped in Cambodia. 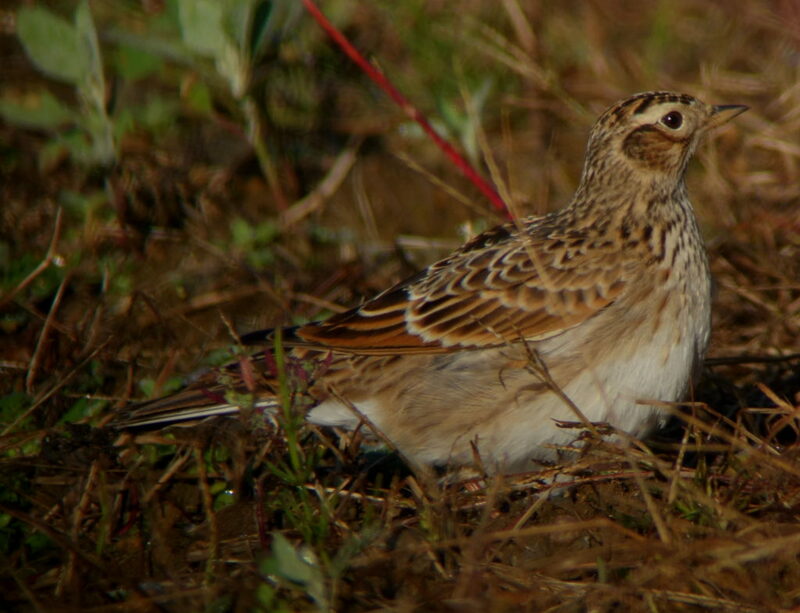 The conclusion: Oriental Skylark really is a highly distinctive species. Any claim of this species outside of the main mapped range therefore needs to be supported by clear commentary of the many structural and plumage features that can be used to separate them from Eurasian Skylark and Far Eastern Lark. Gill, F & D Donsker (Eds). 2017. IOC World Bird List (v 7.3). doi : 10.14344/IOC.ML.7.3.